This week's drizzly rain is sharing the stage with a few sunny, breezy days. Some of the milkweed plants at our team's monarch butterfly research plots are starting to die back and many of the late-season forbs are beginning to show beautiful blooms. Our team is always on the lookout for monarch butterflies and caterpillars. We answered many questions about monarchs and milkweed from farm families who attended the 2016 Farm Progress Show and paid a visit to the Iowa State University tent. After hearing about the Iowa Monarch Conservation Consortium at the show last week, Laura and Bill Foell went searching for monarch butterflies at their farm near Schaller, Iowa. 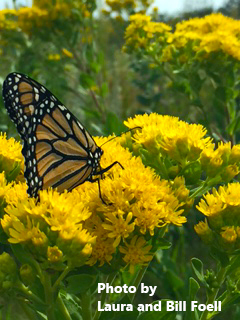 They struck gold in their pollinator plot that was planted four years ago and snapped a photo of an adult monarch feeding on nectar from a goldenrod. Flowering plants that attract pollinators are typically excellent sources of nectar for adult monarchs. Pollinator plantings contain a variety of forbs and other plant species, many of which are also listed in our team's Monarch Seed Mix. Thanks to Laura and Bill for sharing this photo from their farm!